Dvin was one of the most ancient settlements of the Armenian Highland and an ancient capital of Armenia, traced back as far as the 3rd millennium BC. During the excavations of 1958, a settlement of Late Bronze and Early Iron age period was discovered under the citadel of Dvin. Excavations revealed ancient workshops and worship structures from the beginning of the 1st millennium BC, with a metal workshop and four sanctuaries. The latter were large structures that had stone bases and walls made of unburnished clay. Flat roofs rested on wooden columns. Astonishing altar stelae of complex compositions, with traces of “eternal” fire and mostly black-polished utensils used at ceremonies were placed inside these sanctuaries built in the architectural traditions of Pre-Urartian (Araratian) dwellings. In the first half of the 8th century BC, Dvin and numerous settlements of the Ararat Valley were ruined due to invasions. Traces of a great fire and ruins that took place in this period are clearly seen from excavations in Dvin. According to UNESCO Dvin was also the sight of a 6th century B.C. fortress. Fragment from the documentary “Andin. Armenian Journey Chronicles” directed by Ruben Giney. 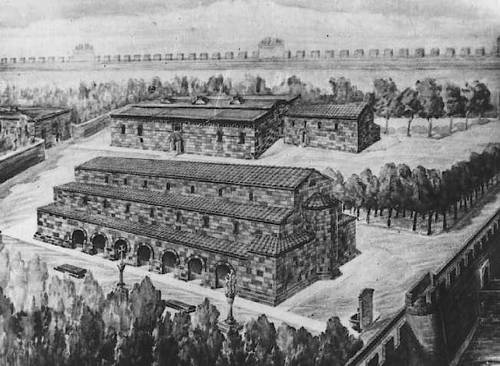 Drawing of the central square of the ancient Armenian capital city of Dvin. The main cathedral of S. Grigor (3rd-5th century), with a small church of S. Sarkis to the right (6th century), and the residence of the Catholicos on the left (5th century). From the first half of the 4th century, Dvin was the primary residence of the Armenian Kings of Arshakuny dynasty and the Holy See of the Armenian Church. King Khosrov II built a palace (in 335 AD.) on the site of an ancient settlement making Dvin the capital of Armenia and subsequently the seat of the Catholicos. The city grew rapidly reaching a population of over 100.000. Dvin prospered as one of the most populous and wealthiest cities east of Constantinople. Dvin quickly turned into a regional economic center, a meeting-point of trade routs from east and west. Six trade routes started from Dvin, which connected the city with Iran, Iraq, Assyria, the Byzantine Empire and countries of the Mediterranean basin. Goods manufactured in the renowned workshops of these countries were imported into Dvin. Production of the craftsmen of Dvin (pottery and textiles) was exported far beyond the borders of the country. It was the center of craftsmanship and transit commerce. In the central district of the city the Armenian Patriarch’s residence was situated with its churches and patriarchate. The city was situated on a hill, on top of which stood the old Citadel and the adjacent buildings. The city had defensive walls formed of two layers, and a temple tower. After the fall of Arshakuny dynasty, Dvin still remained the largest city of Armenia. At the end of 7th century, as a result of Arab invasions, Dvin and most of Armenia came under the power of the Arab Caliphate. The Arabs formed an administrative unit of Armenia, whose center was Dvin. From the beginning of the 8th century, during the Arab rule, Dvin was again a prosperous free-trade city of crafts and goods. Armenian and foreign written sources call Dvin the “Great Capital”. Despite the fact that Dvin was a battleground between Arabs and Byzantine forces for the next two centuries, in the 9th century, it was still a flourishing city. In 1236 Dvin was invaded by Tatar Mongols. Though It was destroyed and robbed, it managed to survive one more century. The last time the city of Dvin had been mentioned was in one of the Georgian chronicles along with other ruined cities. At the site of the ruined city several small villages were built which have survived until present days. Dvin was the birthplace of Najm ad-Din Ayyub and Asad ad-Din Shirkuh bin Shadhi, Kurdish generals in the service of the Seljuks; Najm ad-Din Ayyub’s son, Saladin, was the founder of the Ayyubid dynasty of Egypt. Saladin was born in Tikrit, Iraq, but his family had originated from the ancient city of Dvin. The archaeological sites at Dvin are inscribed in UNESCO. Numerous wonderful artifact uncovered at the sight attest to the high level of craftsmanship practiced by the ancient inhabitants of Dvin. Small pitcher with an image of a musician 11th c.
Vessel with zoomorphic handles, 12th-13th c.
Glazed dish 12th 13th c.
Small pitcher, engraved, 9th – 11th c.
Dish with an image of a winged Sphinx 11th-12th c.
Karas with ornamented bands 10th-11th c.
Capital of S. Grigor Cathedral. 4th c AD. Cover of a karas-vessel or tonir 9th-13th c.
Fragment of a stamped karas-vessel band with lion images 10th-11th c.
Capital with Virgin and Child, late 5th–6th c.
Ruins of Dvin, 10th c.